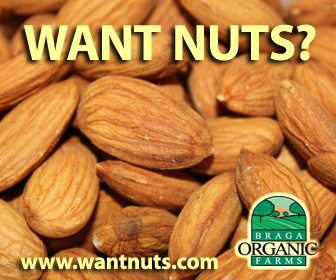 Can you think of one food group that every diet, without exception, recommends? You guessed it—vegetables. Some diets may even prohibit fruit, but you’ll always find vegetables in the mix. In the vegetable kingdom, one variety stands out as the most potent health elixir: dark green leafy vegetables such as spinach, kale, chard, lettuce, arugula, mustard and collard greens, dandelion greens, beet leaves, carrot tops, and their cousins. Low in calories, fat-free, high in fiber—no wonder these leafy greens make it into every diet. What makes dark green food so valuable to us? These vegetables’ dark green color manifests their high chlorophyll content. The more chlorophyll, the more antioxidants the plant develops to protect its cells from free radicals generated by sunrays coming in contact with chlorophyll. All those antioxidants become the property of the host who consumes the greens, offering the same protection against the host’s own free radicals. Chlorophyll is a natural blood-builder. And the quality of our blood determines the health of the rest of the body. So give your body the chlorophyll it needs, along with the alkaline minerals (calcium, magnesium, potassium) needed to keep the blood slightly alkaline. Isn’t it convenient that greens are the best source of alkaline minerals in the plant world? Add in the whole plethora of vitamins (A, C, E, B, K), plus iron and high fiber found in greens, and you get one of the most concentrated sources of nutrients known. One particular benefit of leafy greens is worth mentioning separately. Bodybuilders have long noticed that when they take a nitric oxide supplement, it improves the blood flow to the muscles and regulates blood pressure. Nitric oxide is a free-form gas crucial for a healthy circulatory system, keeping inflammation and blockages at bay. The good news: no need for a supplement. Nature has taken care of us again by providing a special pathway to produce nitric oxide in-house, as it were. This gas is produced from dietary nitrate, which comes from fruits, vegetables and greens—especially dark leafy greens, among which lettuce and spinach are nitrate champions. How much greens you eat shows on your face. Green leaves score high in the beauty category too. Clear skin, glowing complexion, healthy-looking hair: these are just a few of the desirable side effects of a greens-rich diet coupled with a good skin and hair care routine. 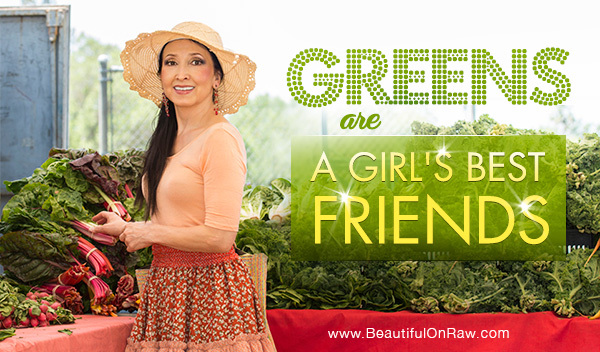 Check it out for yourself: Add more greens to your raw food meals and see if you can tell your facial skin is improving. Many greens are rich in beta-carotene, essential for renewing skin cells. Folic acid in greens also helps produce and maintain new cells, while lutein helps maintain skin hydration and elasticity as well as guarding against sun damage. And you don’t need to go to extremes—no “kale-stuffed kale with kale-sauce.” There’s an easy way to consume good, regular amounts of leafy greens. Blend them together with fruit to make green smoothies, a simple, enjoyable way to usher the goodness in. The nutrients in greens are available to us quicker when we blend them. If you are a beginner, start with mild-tasting greens, such as Romaine lettuce, spinach, bok choy, Swiss chard, beet greens. Once you get to love those, add kale, collards, arugula, endive, mustard and dandelion greens. And before you head out to spend money on the leaves, check your yard for free wild greens, such as chickweed, lamb’s quarters, purslane, nettles, thistle, dandelion and many others, greens even more nutritious than your supermarket produce section can offer. Fall in love with leafy greens. Make green the dominant color in your fridge. Don’t let a day go by without greens. Find the ways to consume them that suit you best, remembering that you and those leafy greens are in it for the long haul. I am convinced that dark leafy greens hold answers to most, if not all of our health-related questions.